For Christians who follow the church year, New Years Eve occurs in Christmastide, the part of the church year pointing to the Epiphany of Jesus. This is not to belittle New Years Eve. Glittering lights, balloons, plastic horns, streamers, fireworks and the hope represented by the popping of Champaign are good things. The reflection that happens on New Years Eve often leads to thankfulness for the goodness of God over the past year. Bright sparks and celebratory music tell the truth—there is hope in the coming of a new year. 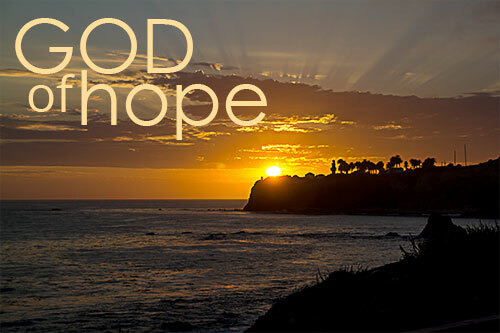 “The God of hope” means that God is hope in his very being. He contains it and liberally supplies hope to his people, filling them to overflowing with joy and peace as we recognize and grasp onto God’s hope. This is big: it means you don’t have to “work hope up” when you are feeling hopeless about something. You just have to ask. But to ask, you have to “trust in him”. You have to place your confidence in him that you are not somehow singled out among the masses to live in hopelessness. Hope is the fuel for life. We cannot live without it. Paul is not just spouting words. He thinks he is saying something important. He is. This News Years Eve, before you head out to your party or get-together of what ever kind, or even if you are staying home to watch the East Coast version of New Year’s Rockin’ Eve you so can go to bed early, take a few moments to place the hope-challenged parts of your life before God. With conviction ask him to give you some hope, even just a bit, so that you can get up on the first of January with some joy and peace through which you can face to the New Year.